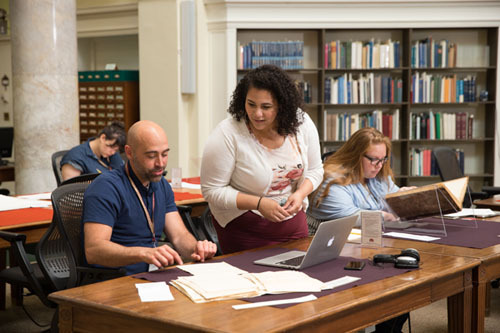 Librarians at the American Antiquarian Society have been working since 1812 to acquire materials important for the study of American history. Because many of these materials are fragile and irreplaceable, we have established policies and procedures to ensure that they will be available for scholarly research for future generations. The library is open, free of charge, to researchers with projects related to AAS collections. Researchers can determine if AAS has material relevant to their project by searching the general catalog or by contacting the appropriate staff member. No appointment is necessary to use the library. Students: Graduate and undergraduate students are welcome to use the library collections. High school students must be accompanied by a parent or guardian. The specialized nature of the research library does not make it appropriate for younger users. Further questions regarding using the library may be directed to Kimberly Toney, Head of Readers' Services, at 508-471-2171 or via e-mail at ktoney@mwa.org.